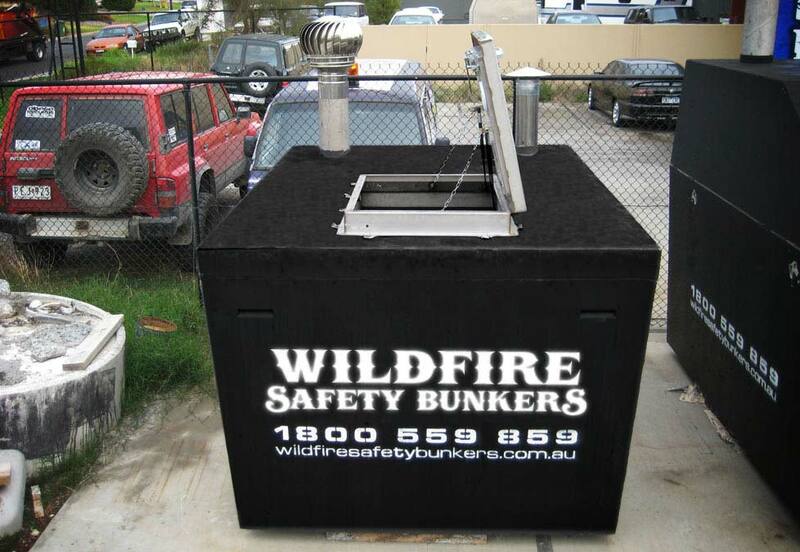 Wildfire Safety Bunkers new fireproof storage vault is now available. This fireproof vault is made to the same high standards found in our Fire bunkers. The vault will greatly assist residents who plan to evacuate if the threat of fire is possible. There is no further need to keep packing the car up with personal belongings every time a fire warning is issued. The fireproof storage vault is approximately 4500 litres in size and has a double locking mechanism fitted to the entry door. It comes with internal steps and also battery operated LED lighting as standard. The flat top, ground level door, allows the vault to be located in a secluded location, possibly in a garden bed. An alarm system can also be fitted to the vault. This product is almost identical to the Personal Storage Vault except that it is fitted with a high volume FIRE CHIEF fire fighting pump and a hose reel. Having the pump housed in the vault greatly reduces the risk of fuel evaporation, vapour lock and fire damage. The unit has ventilation shafts to allow air in, and exhaust fumes from the pump out. The unit has fittings moulded into the concrete top for water supply to the pump and external access to the end of the hose which is in a protective sleeve. The pumps come in either diesel or petrol models pull start or push button battery start. The pump can be sized to also service other fire fighting equipment such as roof top sprinklers. The start button is mounted externally with a protective cover for ease of operation. The hose reel comes in two lengths, 36 metre or 50 metre. The vault will need to be located as close as possible to your water supply. 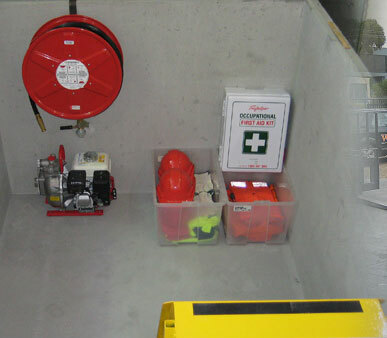 The fitment of the pump and hose reel take up very little space so there is still ample area available for the storage of personal belongings. If you would like further information regarding our new product, please click here and one of our helpful staff will contact you.